Spiros Aspiotis was born in 1985 in Corfu island, Greece. Alongside from childhood, he was always attracted in body and mind movement arts. 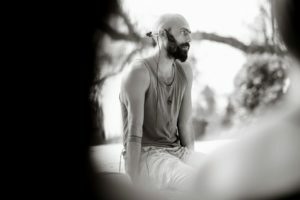 Therefore always based on his intuition he started his inner healing journey by introducing himself in to Thailand’s traditional ancient wisdom, studying with unique teachers ,like Ajahn Pichet, (Thai-Massage) Khuni, (Chi Nei Tsang) David Lutt (Osteo Thai and Dynamic), Rosemary (Craniosacral). During this time he explore and work in fields like, fasting therapy, visceral organ detoxification programs, cellular nutrition ,herbalism, medical astrology and the beauty andthe wisdom of the 5 elements. He then continue his studies in the field of Hatta Yoga and the ancient wisdom of India, studying fields like Vedanta philosophy, Vedic astrology, Ayurveda and other ancient healing ways for reminding to the body the real source of inner balance in all levels. A forgotten world of understanding and perception came out as nectar and show him something that was always there, it was just about to become aware of it. This beautiful body language became the new exploration and observation of his journey .He realize that the more we know the more simple and discipline we are trying to be in order to live in what harmony is trying to explain to us, us humans. Over the last two years Spiros gives treatments, and leads seminars both in and out of Greece . Looking around we see the same universal language, we are and will always be connected under the same circles of rhythm, celebrating the sun and the moon. Because one element is impossible to live by itself. The existence and collaboration of all of them is vital for maintain life and creation .We are the son‘s and the daughter’s of the same father and the same mother It’s just about taking care our body temple and reprogramming our cells to work towards a sustainable -rhythmic healthy life circle,as it is already programmed before we meet this world. Thai massage is widely known as the practice of what Buddhists call loving kindness. It is a practice of giving, caring and respect, first towards ourselves and consequently towards others. Through touching the body we not only touch the anatomical / physical part of it but can also penetrate at a deeper more etheric side of us. Some of the basic principles which contribute toward a more harmonious co-existence with the “environments”, in and out of ourselves are touch, silence, movement, caring and intention. Our goal is inner health – harmony. Physical contact (touch) is a daily human need and remains one of the most effective forms of expression. There is a wonderful cellular code of communication and physical intelligence just under our skin. A touch is enough for us to feel if we are welcomed, safe or in danger. During this seminar we will have the opportunity to delve into the fascinating world of Thai massage using simple and safe techniques. The techniques taught during this workshop are carefully selected regarding their level of difficulty and their effectiveness in order for you to be able to share what you have learnt with the ones you love. 1) Anyone interested in having a first experience with Thai massage, beginners who want to dive deeper into their practise but also for advanced practitioners. 2) For those who wish to practise and share thai massage with their friends and family. 3) Practitioners of other types of massage or yoga who would like to enrich their own practice. 4) For those who simply want to express their love and to discover the beauty of sharing, receiving and giving.